32 parliamentarians from Finland, Sweden and Denmark today requested the Ministers of Foreign Affairs of their countries to prevent renewed EU fisheries in occupied Western Sahara. Press release, WSRW, 7 July 2010. 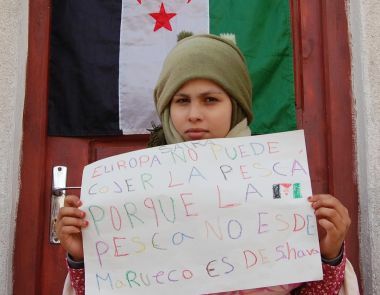 “We urge the governments of Denmark, Finland and Sweden, to actively and jointly work to prevent an automatic prolongation of the EU-Moroccan fisheries agreement as long as Western Sahara is not clearly excluded from its application”, stated the letter, urging that the EU fisheries offshore the occupied territory terminate. The EU is currently paying its tax payers money to the Moroccan government to be able to fish in offshore Western Sahara, a territory that Morocco has occupied. Sweden, Denmark and Finland all treated the 2007-2011 EU-Moroccan fisheries agreement seriously when it was first debated in the European Council in 2006. Sweden voted against the agreement, stating it was in violation of international law. Denmark and Finland also raised concerns about the legality of the agreement. Finland abstained from the vote, underlining that the Saharawi people must be consulted. The European Commission has since ignored the conditions the Finnish government set in its separate statement in 2006. The letter from the parliamentarians point to a Legal Opinion of 2009, made by the Legal Service of the European Parliament, which concluded that the conditions for respecting international law have not been met: there is no proof that the Saharawi people has been consulted, nor that it has benefited from the agreement. During the three years of fisheries, the Commission has not been able to present a single piece of information showing the contrary. Both the Saharawi representative, formally recognised by the UN, the Polisario Front, and all major Saharawi civil society organisations have made clear statements against the present agreement and any new version that includes their own territory. “We expect that the Swedish, Danish and Finnish governments will stand by their defence of international law, as a basis for a determined, constructive Nordic action for a fully legal agreement. That would also bring the EU in line with the US and EFTA, who in respect for international law clearly exclude Western Sahara in agreements with Morocco”, stated the parliamentarians. The letter was signed by parliamentarians from the Social Democratic Party, The Greens, The Left Party and Left Alliance, the Christian Democratic Party, the Liberal Party, the Center Party, the Socialist People’s party and the Danish Red-Green Alliance. Minister of Foreign Affairs of Denmark, Ms. Lene Espersen. A common Nordic position on the new EU-Moroccan Fisheries Agreement? In August 2010, the EU-Moroccan fisheries agreement, allowing for EU vessels to fish offshore occupied Western Sahara, is up for renewal. The agreement has fundamental legal, ethical and political implications, and the undersigned urge the Nordic governments to prevent it. There is a long-standing consensus among Nordic governments on three important aspects of the Western Sahara issue: (1) that Western Sahara is a colonial, Non Self-Governing Territory, (2) that the Moroccan sovereignty claims over Western Sahara are unfounded, (3) that the natural resources of Western Sahara should be governed according to international law, by respecting the Saharawi people’s right over its natural resources, taking into account the people’s wishes and interests. It should be recalled that Sweden, Denmark and Finland treated the 2007-2011 EU-Moroccan fisheries agreement seriously when it first was debated in the European Council in 2006. Sweden voted against the agreement, stating it was in violation of international law. Denmark and Finland also raised concerns about the legality of the agreement. Finland abstained from the vote, underlining that the Saharawi people must be consulted. We note that the European Commission has since ignored the conditions the Finnish government set in its separate statement in 2006. In its opinion of July 2009, the Legal Service of the European Parliament concluded that the conditions for respecting international law have not been met: there is no proof that the Saharawi people has been consulted, nor that they have benefited from the agreement. The Commission has during the 3 years of fisheries not been able to present a single piece of information showing the contrary. Both the Saharawi representative, formally recognised by the UN, the Polisario Front, and all major Saharawi civil society organisations have made clear statements against the present agreement and any new version that includes Western Sahara. In May 2010, Morocco furthermore refused the European Parliament to visit the territory in order to investigate the implications of the cooperation. Despite all this, the Commission claims the agreement is in accordance with international law, and the preparations for a new EU-Moroccan fisheries partnership agreement are already under way. We urge the governments of Denmark, Finland and Sweden, to actively and jointly work to prevent an automatic prolongation of the EU-Moroccan fisheries agreement as long as Western Sahara is not clearly excluded from its application. We expect that the Swedish, Danish and Finnish governments will stand by their defence of international law, as a basis for a determined, constructive Nordic action for a fully legal agreement. That would also bring the EU in line with the US and EFTA, who in respect for international law clearly exclude Western Sahara in agreements with Morocco. We suggest that this be done in contact with other like-minded EU member states and associated countries.